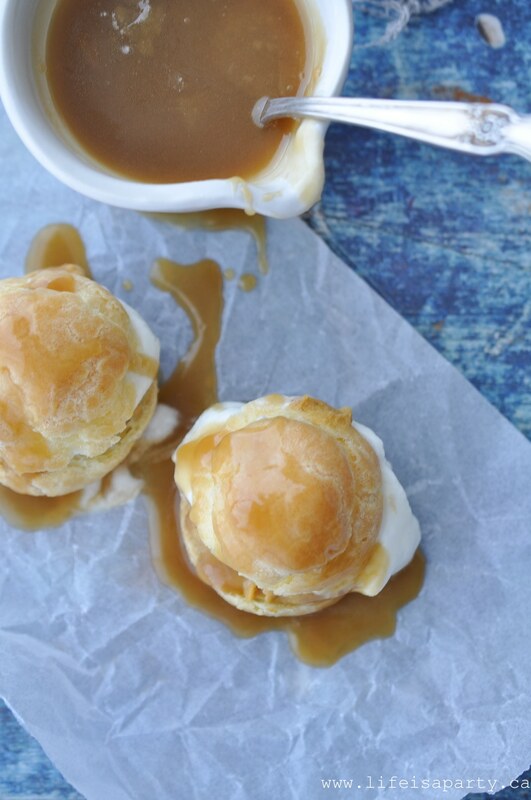 Pumpkin Cream Puffs: A cream puff filled with pumpkin pastry cream, whipped cream, and topped with warm caramel sauce for the perfect fall dessert. 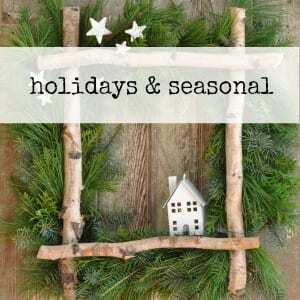 I’m so excited to be joining in with the Seasonal Simplicity Fall Series hosted by Krista at The Happy Housie. 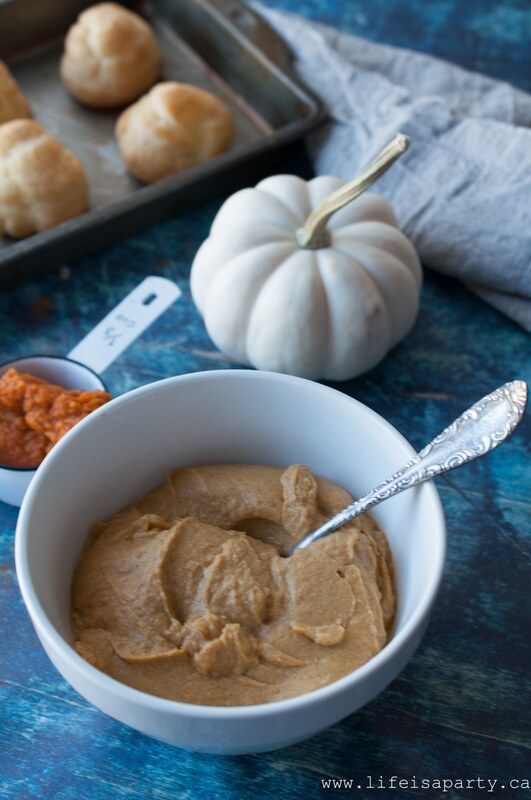 Today we’re sharing 25 amazing Fall Recipe Ideas. Be sure to check them out at the bottom of the post. 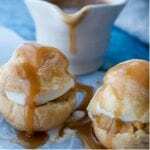 I’m sharing a recipe for Pumpkin Cream Puffs. These are a real fall favourite. They’re perfect for fall entertaining. If you’re looking for something a little bit out of the ordinary then these are perfect. There are a few different components to make, but I promise when they all come together into the perfect fall bite, you’ll see it was all worth it. Combine water, butter, salt, and sugar in a medium pan and bring to a boil. Remove the pan from the heat. Add the flour to the pan and beat until everything comes together. Put the pan back on the heat and beat vigorously until everything is off the sides of the pan. The dough will lump together and there will begin to be a film on the bottom of the pan. Next, put the dough mixture into a stand mixer and beat until it breaks up a little. Add the eggs one at a time into the dough, and beat until it all comes together. It might seem like it is not going to come back together, but keep mixing, and it will. Once all the eggs are added and the dough has come together, transfer it into a piping bag -or just a ziplock bag with the corner cut off. Line a baking sheet with parchment paper -or spray with cooking spray. Pipe drops onto the baking sheet. 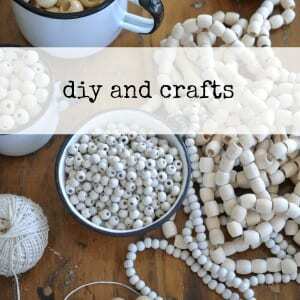 Moisten your finger with water to smooth out the peaks. Bake in a preheated 425 degree oven for 15 to 20 minutes. They will be golden brown and puffed when they're ready. 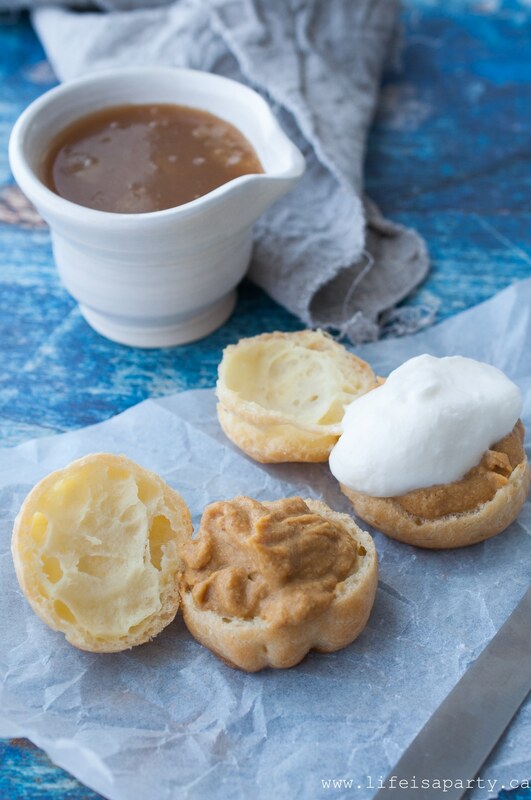 To serve, slice each cream puff in half and fill with 1 tbsp of pumpkin pastry cream (see recipe below), and 1 tbsp of sweetened whipped cream. Replace the lid. 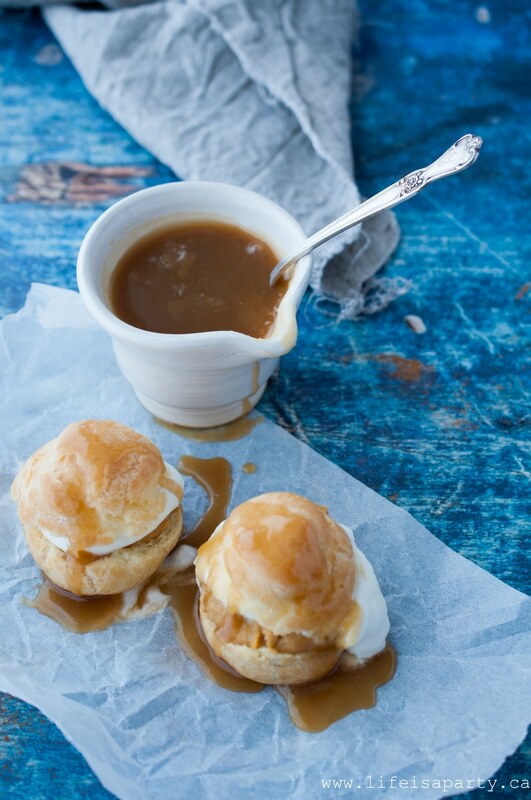 Pour warm caramel sauce (see recipe below) over the top and enjoy! 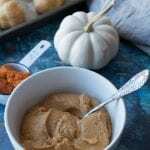 Whisk together whipping cream, pumpkin puree, cinnamon, ginger and cloves in a medium saucepan. Bring to a simmer over medium heat. In a separate medium bowl, whisk egg yolks with sugar and salt, then whisk in cornstarch until mixture becomes pale yellow and thick. Slowly whisk about half of the hot cream into the yolks to temper, then return the yolk/cream mixture back to the saucepan and cook until thick and glossy. Remove from heat and whisk in butter and vanilla. Transfer to a small bowl and press plastic wrap flush to the surface. Chill. 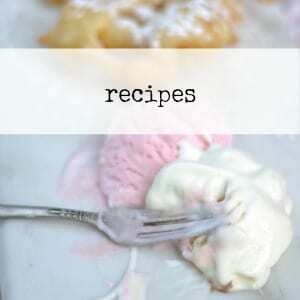 Combine butter, brown sugar, half and half cream, and salt in a medium pan, and cook while stirring gently over a medium heat until the mixture begins to thicken. Add in vanilla and cook for another minute. Remove from heat and serve warm. 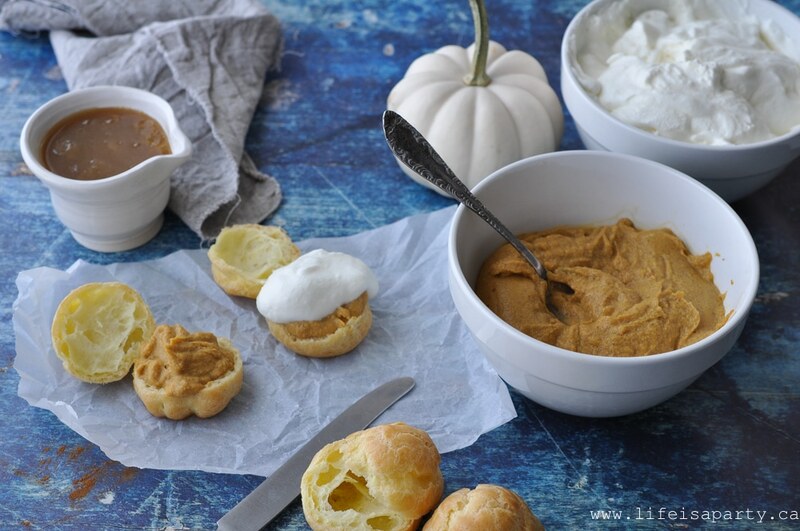 If you want something other than the traditional pumpkin pie, these are perfect. 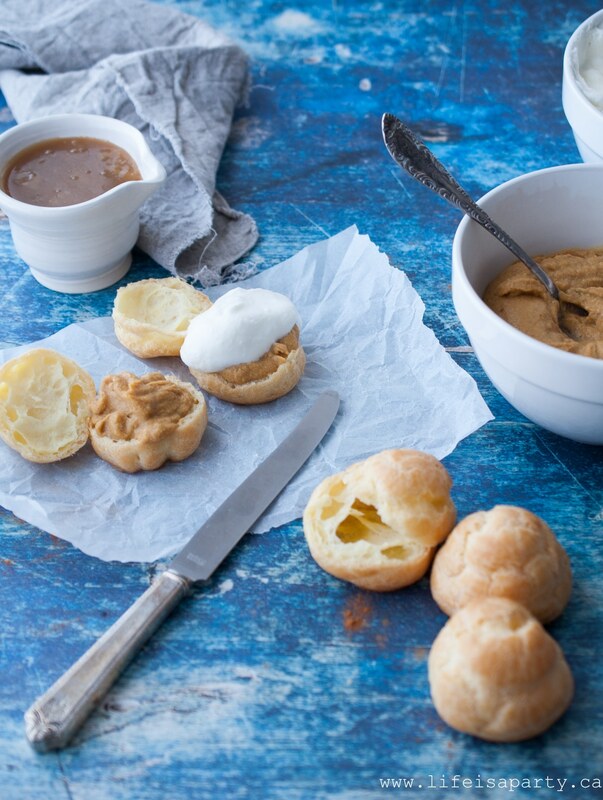 The puffs themselves are best eaten the day they’re baked since they have a crisp consistency on the outside, but the other components can all be made ahead, and the sauce can be warmed up in the microwave just before serving. 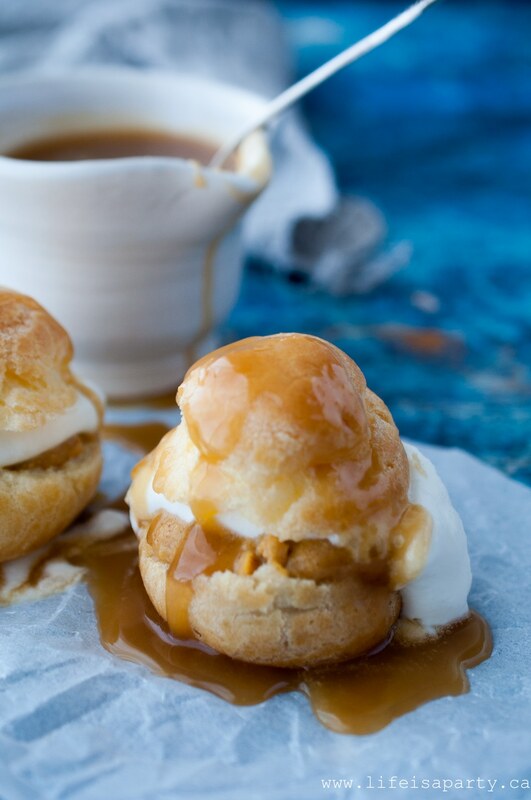 With homemade Pumpkin Cream Puffs, life really is a party! These look delicious Dannyelle! 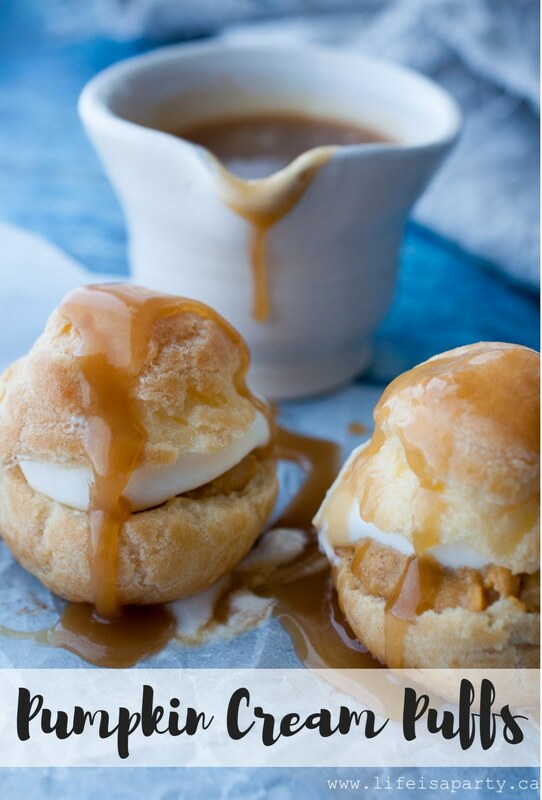 Cream puffs are THE BEST! When your guests like the plate and ask for seconds, they MUST be GOOD! 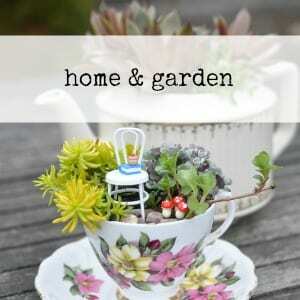 Thanks for sharing them with us on the blog hop. 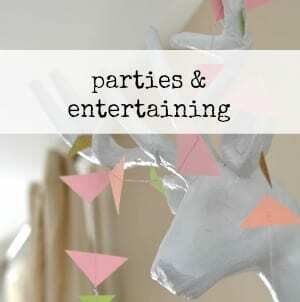 Krista, thanks so much, and thanks so much for letting take part in the blog hop!